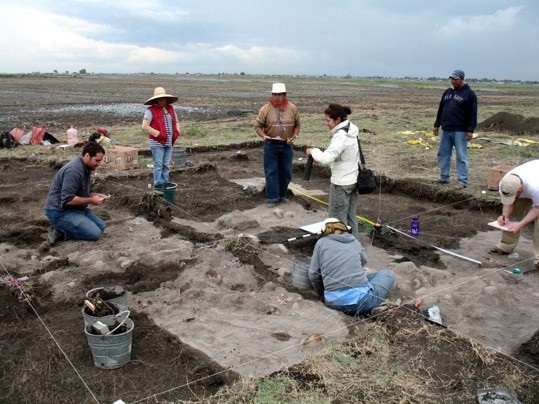 Archaeologists find strange mound of sacrifice victims’ skulls at field in Mexico. MEXICO CITY — Archaeologists say they have turned up about 150 skulls of human sacrifice victims in a field in central Mexico, one of the first times that such a large accumulation of severed heads has been found outside of a major pyramid or temple complex in Mexico. 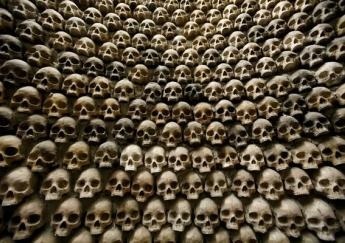 Experts are puzzled by the unexpected find of such a large number of skulls at what appears to have been a small, unremarkable shrine. The heads were carefully deposited in rows or in small mounds, mostly facing east toward the rising sun, sometime between 660 and 860 A.D., a period when the nearby city-state of Teotihuacan had already declined but the Aztec empire, founded in 1325, was still centuries in the future. While the Teotihuacan culture and the Aztecs were known to practice human sacrifice, and remains of hundreds of victims have been found in their pyramids or other large structures, the Xaltocan mound “is like a bump in the landscape that you could really easily walk over and not know you’re standing on it,” Morehart said. The skulls were found with a shorter length of vertebrae attached to the skulls than is the case of other such finds, suggesting the decapitation cut was made closer to the base of the skull. Still other strange details emerged: Morehart said some of the skulls were found with finger bones inserted into the eye sockets. “It was common enough that it was intentionally placed there in the eye socket,” Morehart said, though the ritual significance of that remains unclear. Objective: You can write an accurate summary.